The Temple of the Silver Lady is the epicenter of the Great City’s oldest and possibly least understood religion. The original temple predates the other structures of the Temple district by at least a century, and may even predate the city itself. The earliest record of the religion describes a sacred meadow marked by eight menhirs centered round a huge geode which reflected moonlight so brightly, that it appeared the night stars had fallen from the sky to dance amongst the mortal worshippers. This set of products is based on Øone’s popular Blueprints. In Blueprints Backdrops, you will find a fully developed version of one of the locations from the Blueprints line. The Backdrop features a complete description of the location, and its NPCs and monsters (if any), penned by one of our talented writers, and portrayed by skillful artists. You also get a simpler version of the map found in Blueprints and a complete detailed 3D map of the location. The 3D view will help you to visualize the area and better describe it to your players. You can even show it to them, if you wish. Using the exclusive “Rule the Dungeon©” feature (look for a big, blue-n-white button – don’t worry, it won’t print) you will be able to fully customize this product. The 3D map can be changed to show only one floor (for example), with or without walls (for another), with or without furniture, only an external view, and on and on, with many combinations possible! This product has also been designed to help busy referees prepare adventures – or even single encounters. Instead of spending extra time scaling the encounters to your party, the d20 stats are scaled in three different versions suitable for low, mid, and high levels of play, using a “Rule the Dungeon©” button. 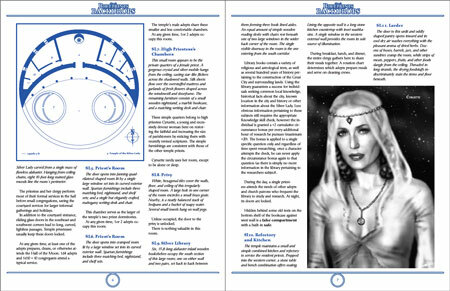 An RPG Resource Review: The Temple is to be found in the ..